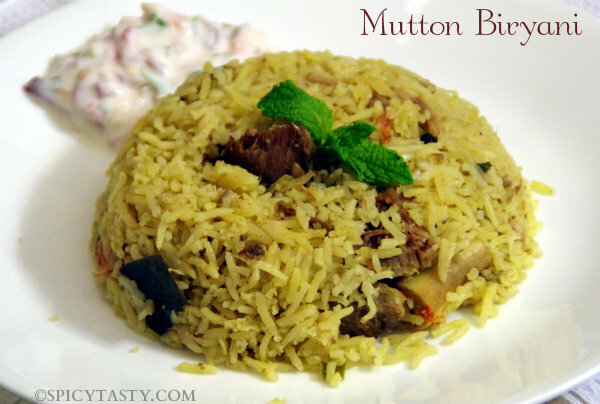 I have heard a lot about how difficult it is to cook a perfect mutton biryani. They say the hardest part is to cook the mutton perfectly. 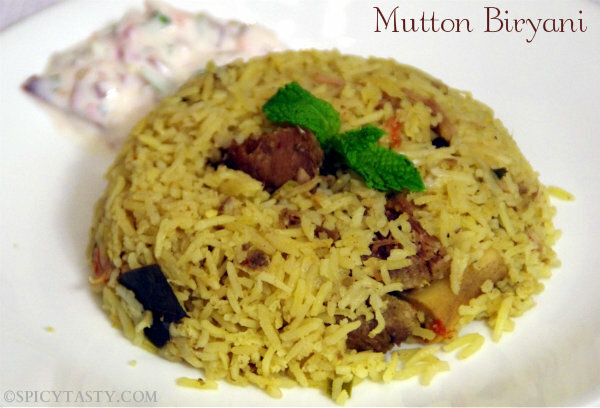 Here is a flavorful recipe for all the Mutton Biryani lovers. This recipe was given to me by my good friend Victor. He is an enthusiastic cook. Though I do not eat non-vegetarian food I have heard all my friends praising about this biryani. 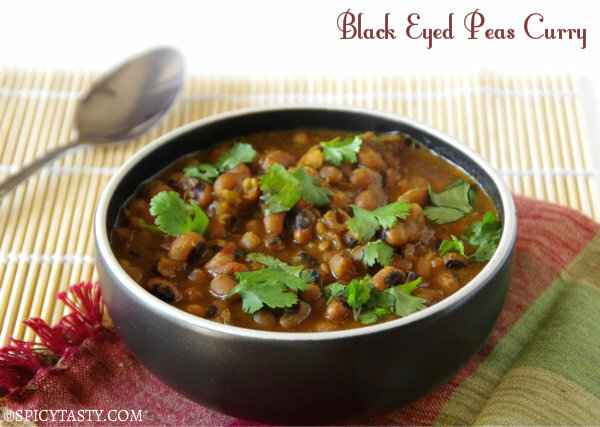 So I thought I will share the recipe with you. Victor took all the effort by taking step by step pictures of the making and the presentation. My job is to share this recipe to you. 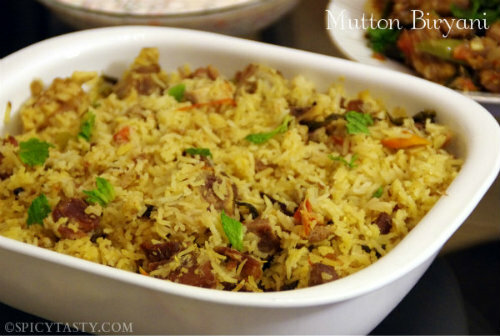 Hope you all enjoy this lovely biryani and don’t forget to write your comments. Wash mutton a couple of times and pressure cook with salt and 1/2 tsp of crushed black peppercorns. Add water until the mutton is fully immersed. Cook for 4 to 5 whistles. Mutton should be very soft but not over cooked. Transfer mutton to a bowl and reserve the mutton stock (remaining liquid from the cooked mutton). Heat 5 tbsp of oil in the same pressure cooker, add cut green chilies, chopped onions and saute until brown and caramelized. Add all the spices except turmeric and garam masala and saute for 5 minutes or until the spices releases its aroma. Add salt, finely ground ginger and garlic paste (equal amount), mix well for a minute and add chopped tomatoes. Cook until tomatoes are mashed. Add turmeric powder, garam masala and mint leaves, cook for a minute and add mutton. 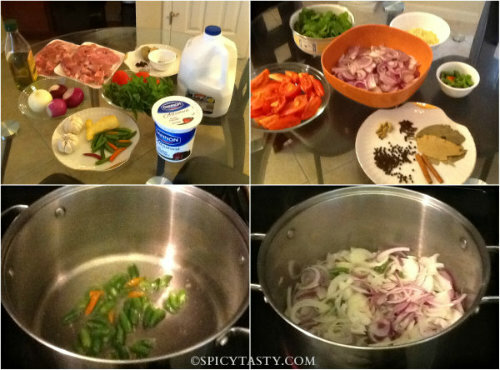 Mix everything well and let the gravy cook for a couple of minutes to coat with all the spices. Add 4 and 1/2 cups of reserved mutton stock to the gravy. If you do not have enough stock add water. In between rinse basmati rice and spread it in a towel or paper towel to absorb the moisture. Heat a tbsp of oil (preferably olive oil), add basmati rice and saute for a couple of minutes. Add this to the gravy, mix well, add some more salt and pressure cook for 15 minutes over low heat and turn off the stove and leave it for another 20 minutes. Now that the pressure will be released, slowly remove the lid and transfer the contents to a serving tray. This is perfection! I’d be nervous to even try…. Never get bored of this super flavourufl briyani, makes me drool. Just tried it and loved it! Thank you for the recipe! Going to bookmark it! im going to make this biryani for the first time but am a bit confused by step 11!!! do i add the sauted rice to the meat and spice mixture???? You can add the sauted raw rice to the pressure cooker along with cooked meat. When you pressure cook, the rice will be cooked. We used a gas stove for cooking but time may vary if you are using an electric stove (cook for a little longer, around 20 minutes and then leave it for another 20 minutes). Please let me know if you have any other questions. do i add the rice into the meat and spice mixture raw or after i’ve cooked the rice????? Tried last week,came out really yummy.. This is the first time I have ever tried a non-veg briyani. 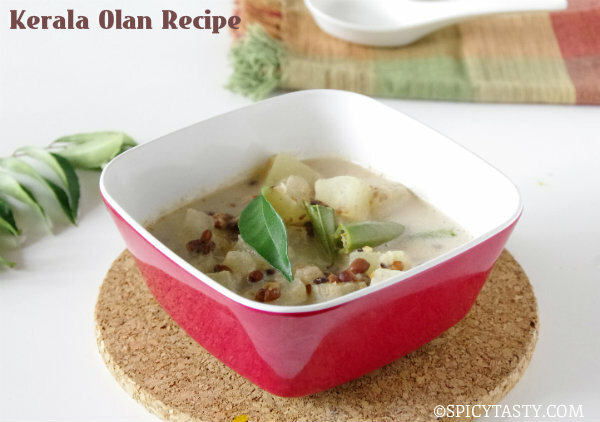 Among all the recipes I surfed, this recipe really gave me confidence to try. My hubby loved it! Thanks much to Nithu and Victor. This one is a “Keeper”….simple, yet all the flavours of a biryani comes thro….first time i tired a biryani and it came out sooooo well…thank you.. Thank u all for the wonderful comments. Great recipe. First time I have used my pressure cooker for a rice dish and it turned out great. Looking forward to trying other recipes.